One of my husband’s favorite fall foods is a caramel apple. Halloween, October 31 is National Caramel Apple Day. Did you know that there are special food holidays throughout the year? Why not celebrate some of your favorites during the months of September and October? See foodimentary.com for a full listing. After enjoying a hay ride or corn maze, why not savor some of the healthful and tasty produce of the autumn harvest like sweet potatoes (one of my favorites) and squash, apples, or pears. 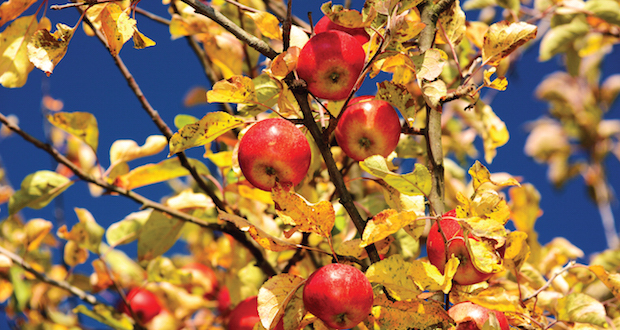 October is National Apple Month so be sure to pack those school or work lunches with a sweet, crispy, crunchy treat. There are more than 7,500 different varieties, so you could try a different one each day for more than 20 years. Nearly 200 varieties are grown in the United States, but these are the most popular according to the U.S. Apple Association: Gala, Red Delicious, Fuji, Granny Smith, Honeycrisp, Golden Delicious, McIntosh, Cripp’s Pink/Pink Lady®, Braeburn, and Jazz. Idaho is in the top 10 of the 32 apple-producing states. The United States is the world’s second-largest producer of apples. China is first. Fall fruits like persimmons, cranberries, pears, and pomegranates make for a festive table and have numerous health benefits. Most persimmons are imported from Asia; American-grown species come from the Southeast. Resembling a bright orange peach wearing a leafy cap, persimmons can be considered an even healthier option than apples thanks to their fiber, antioxidants, and minerals. Allow them to ripen at room temperature before eating because underripe persimmons can be extremely tart. Cranberries taste best October through November, though only 5 percent are sold as fresh produce. Most cranberries are canned, dried, or turned into juice. Research suggests that fresh cranberries can help prevent oral diseases and slow the growth of cancer. Cranberry concentrate can help prevent urinary tract infections. You can pair pears with other flavorful fall fruits or satisfy your sweet tooth by snacking on the two most popular varieties in the U.S., Bosc or Bartlett, grown on the west coast. Incorporate pears into recipes from breakfasts or salads, or concoct healthier cocktails. High in soluble fiber, which helps lower “bad” (LDL) cholesterol, pears are a perfect alternative to apples in lunch boxes. Pomegranates are held sacred by many ancient religions. Deseeding these sweet fruits can be labor intensive but worth it. Though studies of the health benefits of pomegranates are inconclusive, the fruit’s antioxidants may help prevent breast and colon cancers and reduce the risk of cardiovascular complications like heart attacks. Fall season vegetables include the entire cruciferous family—cabbage, rutabaga, and cauliflower—which offers a compound known as glucosinolates that may also have cancer-fighting potential. Brussels sprouts and cabbage are packed with vitamins A and C and boast high concentrations of cancer-fighting glucosinolates. At their best in the fall, beets come in a variety of hues—from the familiar reddish-purple color, to golden, white, and even multicolored. Look for firm, smooth bulbs and (if attached) bright, crisp greens. Roast the beets for their betaine—a compound that may help prevent heart and liver disease—and nitrate, which may increase blood flow to the brain and potentially reduce risk of dementia. Toss the greens in salads for a fresh treat that can’t be beat. Often featured in festive photos and centerpieces on Thanksgiving tables, squash is autumn’s poster food. Beautiful and colorful, squash offer healthy alpha- and beta-carotene, which promote good eyesight. Go out of your gourd enjoying spaghetti squash and its pasta-like strands, as well as acorn, butternut, and delicata squash. Further down the squash family vine are pumpkins, another source of alpha- and beta-carotene, which can be converted into retinol to promote healthy vision. Save the seeds after you carve your jack’o lantern for Halloween because pumpkin seeds are a good source of alpha-linolenic acid, an omega-3 fatty acid that may help those with heart disease, high blood pressure, or high cholesterol. Toasted pumpkin seeds are delicious and nutritious. Rutabagas and turnips are not as photogenic as squash or pumpkins, with their bulbous shape and sometimes hair-like roots, but these root vegetables are nutritious. One cup of raw rutabaga offers three grams of fiber. Turnip greens are a source of calcium and research suggests eating turnips and rutabagas may help reduce the risk of prostate and lung cancers. Sweet potatoes have the best flavor during autumn, their peak season—no wonder they are prominent at Thanksgiving dinners. Like squash, these orange beauties are rich in beta-carotene, which can promote healthy eyesight, prevent vitamin A deficiencies, and generate retinol production. A good source of vitamin C, a medium sweet potato provides nearly four grams of fiber when eaten with the skin on. Fall for these fresh, delicious foods this autumn. Harvest the health benefits and don’t be afraid to try something new. Delicious treats are waiting for you when dining out in Eagle this fall at Bella Aquila. Chef Matthew Alloway, who is celebrating his sixth year with Bella Aquila, notes that when fall color and cooler weather arrive, people start looking for heartier meals. Alloway says their pastry chef will create nut breads and banana bread for brunch. Fall is the season for Alloway’s famous Hunter Sauce, made with fresh local mushrooms, onions, and fall vegetables. “It’s hearty and aromatic and goes well on grilled steak,” states Alloway. He plans to incorporate fall vegetables like squash, pumpkins, and acorn squash into pastas and specialty soups. When the temps start to fall, take the bite out of the chill with one of Bella Aquila’s daily specials. Flatbread, Idaho’s locally-owned and only VPN-certified Neapolitan Pizzeria, is opening its sixth location in the Eagle Island Marketplace at Chinden and Linder in late September 2016. Awarded Boise Weekly’s “Best Family Restaurant” numerous times, Flatbread is bringing to Eagle what you already know and love about their restaurants—including their Pick-Two lunch special and Kids Make Their Own Pizza!—but will continue to expand on its authentic and ample menu. Company Executive Chef Tal Jude will be introducing several new menu items at the new location, including Pan-Sauce Prawns over Crispy Polenta, and even an Italian themed grass-fed/grain-finished hamburger with calabrian chili, bacon pepper jam, finished with pistachio nut butter and gorgonzola. 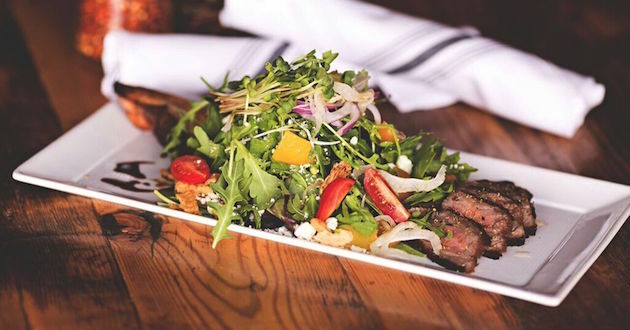 Of course, you’ll still find recent additions to the menu such as the perfect-for-fall, wood-fired Caramelized Onion Soup and their Grilled Artichoke Salad with watermelon radish, micro-greens, goat cheese, and lemon basil vinaigrette. Jude will release his Fall/Winter Seasonal Selections menu soon. Director of Operations, Denton Musser says Flatbread was able to take advantage of the new location’s large kitchen by adding cooking equipment previously unavailable to the existing restaurants. “We’re stoked to have the opportunity to be as creative as we can be, continue to use authentic ingredients, and bring an exciting rendition of our brand to this side of town,” Musser says. “That’s one of the cool things about being a part of a local company…you’re not bound by some corporate decree where every location has to be the same.” Flatbread has a full bar, Italian sodas, and one of the best Happy Hours in the Treasure Valley with multiple food specials and 50% off all cocktails, glass wines, and drafts, of which there will be 6 on tap with a lean towards local, as always. Happy Hour runs from 4-6pm Monday through Friday and late night 9-close on Friday and Saturday. With multiple gluten-free options, Flatbread has something for everyone and as the temperatures drop, it’s a perfect time to cuddle up next to their wood-fired pizza oven. Other Flatbread locations are Downtown Boise, Bown Crossing, Downtown Meridian, Salt Lake City, and Bend, Oregon. Naomi Preston, owner of Wild West Eatery and Cantina, opened the cafe when Eagle was still a bit wild. When Highway 44 was built bypassing the downtown Eagle business district, Naomi got creative and delivered iced coffee on horseback, calling it the Pony Expresso. Since that time the offerings at Wild West have expanded to not only include a roundup of breakfast items such as a breakfast wrap of scrambled eggs, cheddar, and ham, or the world famous sticky bun, but now Wild West offers Happy Hour from 3–5pm Tuesday–Saturday. Enjoy your favorite Frapp, Latte, Mocha, Beer, or Wine. $1 off all drinks. Food is also available all day. A recent special was Coho salmon with tri-colored organic carrots in a brown-sugar bourbon sauce. Warm up this fall with a bowl of homemade chicken and wild rice or tomato bisque or chili and cornbread. Musicians will also serenade you in the evenings. Check their Facebook page for the latest specials and events. Paul Faucher, the former executive chef of 10 Barrel Brewing opened the aptly named GRiT on November 12, 2015. The eatery is aptly named because this former Marine has plenty of grit and lots of talent. Dave Faulk, who co-owns Grit with Faucher, is also the owner of Porterhouse Market. Faulk sources great meats and Faucher presents them at their flavorful best. A constantly changing menu emphasizes locally sourced seasonal foods. 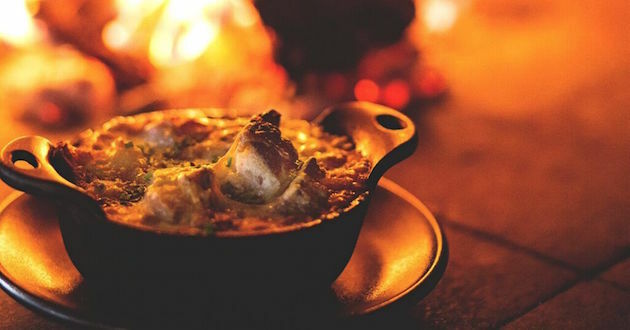 Check out the chow at Grit this fall, including the tasty heirloom tomato salad made with manchego cheese, heirloom tomato, basil oil, charred ciabatta, and lemon vinaigrette, or try one of their other specialties like chicken pot pie or crispy cauliflower. If you can’t go fishing this fall and catch your own trout, you can still camp out at Bardenay and capture a great meal of Hagerman trout, grilled with capers in a balsamic reduction sauce, served with garlic mashed potatoes. Or sample the charbroiled salmon fillet sandwich with mango-orange barbecue glaze and caramelized onion on toasted artisan bread. Tuesday is our favorite day at Bardenay for their hearty jalapeno cheddar soup. There’s more than rice at Rice. There are numerous sushi options and vegan offerings of Yummy Mocky—mock protein tossed in spicy and sweet sauce, broccoli, zucchini, and onion served with white jasmine or brown rice. Those who are gluten-free can warm their tummies this fall with Tom Kha Coconut Soup made with your choice of meat or tofu, coconut broth, lemongrass, mushroom, onion, and cilantro or Tom Yum Soup created with your choice of meat, herb broth, lemongrass, mushroom, onion, and cilantro. Try a Prawn Bloody Mary, voted Best of Boise 2015, during Rice’s Happy Hour Monday–Saturday from 4–6pm or during Thirsty Thursday from 4–9pm—buy one drink, get one free—and enjoy live music on Thursdays from 6–9 too. Oak Barrel offers a private room for autumnal parties and a wide selection of wines and drinks. Enjoy the creativity of executive chef Mike Gradian who manages a “scratch” kitchen where everything, including sauces and dressings, are made fresh and in-house. Happy Hour is daily from 3–6pm with $2 off wines by the glass, half-price beer, and $1 off well drinks. Glutiny, Gluten Free Beer, and Sockeye Sour Puss is on draft. Keep warm in the lounge on Friday and Saturday nights and treat yourself to a festive fall feast and live music. If you want to warm up the crowd during an autumn evening, Karaoke begins at 8pm on Wednesday nights. Ribs are popular at summertime BBQs and picnics, but they are also a fall favorite especially at Tricia and Joel Anderson’s Bodacious Pig Barbecue. Open since March 25, 2013, Bodacious Pig welcomes barbecue devotees who savor slow-smoked meat. The Texas-style method of cooking in a barbecue pit, with the meat seasoned by a dry rub, makes this eatery a popular fall destination. The menu features Snake River Farms and Double R Ranch steaks, seafood, sandwiches, and house ground burgers. Save room for dessert—my personal favorite is the cobbler. Tricia’s favorite menu items include pulled pork, ribs, tri-tip, and their specialty sides and salads, which she prepares fresh each morning while Joel mans the pits. “We slow cook our meats fresh each day, so when we run out, we are out for the day.” Get there early for a fall feast. Here’s some more autumn treats you’re sure to fall for. September is National Rice Month so why not try this stuffing recipe with wild rice. It might become a family favorite at Thanksgiving too. Oil a 2-quart baking dish or casserole pan and reserve. In a small saucepan, bring 1 cup of water to a boil and cook the wild rice in it. It will take 30-45 minutes, depending on the type of wild rice. When tender, drain and reserve. Cube bread and put in a large bowl, toss to dry out while you prepare the other ingredients. Melt the butter in a large sauté pan over medium high heat and add onion, celery, and carrots. Stir, reducing the heat to medium as it starts to sizzle. Cook until the carrots are tender, about 10 minutes. Stir in the apples and sage and stir until the sage is fragrant, about 3 minutes. Add stock and dried herbs, then pour the contents of the pan over the bread cubes. Add the cooked wild rice and fold all the ingredients together with a big spoon. Press into the prepared pan and top with walnuts. Bake at 400 for about 35-40 minutes, until the top is browned and an instant-read thermometer inserted into the center of the pan reads 150 ºF. Trim ends of broccolini. Slice any large stalks in half for even roasting. Core apples and cut each into 8 wedges.